This may be the easiest plant on earth to care for. All it needs is medium indirect sunlight and to be watered weekly. We have two of these in our home. I really love the way they look, one lives in our study, and the other in our dining room. Some of the toxins that this plant removes from the air: benzene, formaldehyde, trichloroethylene, xylene, and ammonia. They come in all sizes! They do continue to grow and mine have been re-potted twice. 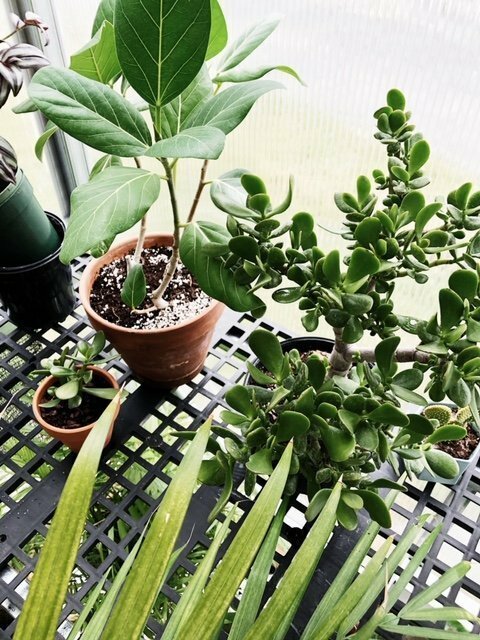 These plants will put humidity back into the air…so if you have some dry rooms you may benefit from having this plant there! This is also pretty simple to care for. Aloe is actually in the succulent family. We have several of them, and they are all in bedrooms. They are known to help you sleep at night–because when the sun goes down, they emit oxygen which will increase the amount of oxygen in the air. Read: you will sleep better. They are also great to use for cuts+burns+scrapes. It also removes benzene from the air, which can be found in many chemical cleaners and paints. If you haven’t noticed, simple is key around here. So, this is another one that is easy breezy. We have one in our kitchen, it’s a pretty small, but that is exactly what I wanted in the space I have it in. What I like most aside from it’s sleek look is that it eliminates 4 out of 5 major indoor air contaminants. 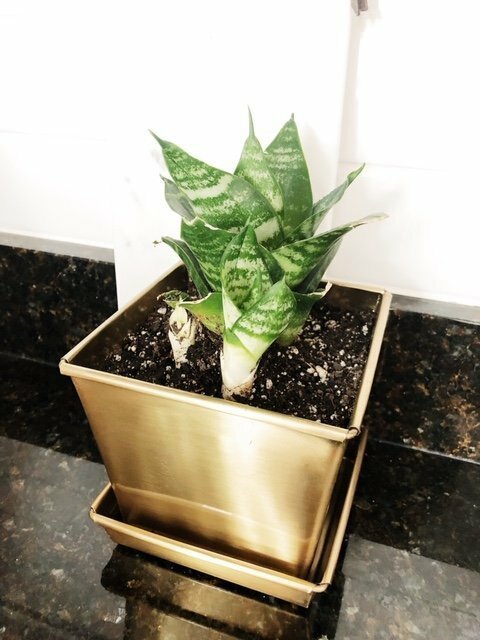 You can find my brass planter here. My FLF was a sweet gift from my mom! It needs a bright sunny room+water about every 2 weeks. This is for sure the most demanding and high maintenance of all. Don’t move it, and do not put it near an air vent. Find a spot in your home and leave it there! Ours lives near a window, and I rotate him every few weeks and clean the leaves 1x a month. 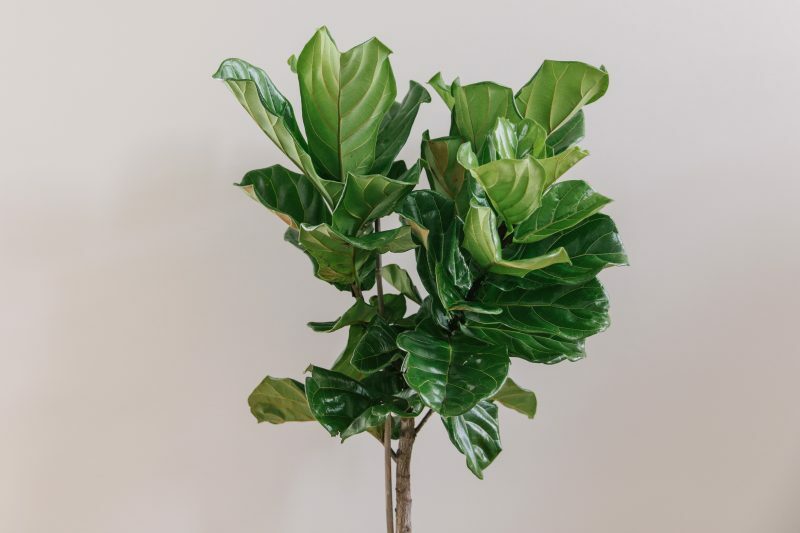 Aside from FLF being visually appealing+high maintenance, they are wonderful for improving air quality. It also cleans the air of allergens+provides high levels of oxygen. Win. I use this plant food and this moisture meter to keep him healthy. This plant requires the bare minimum. I had this plant in my corporate office, and relocated it home when I quit. I had the perfect space for it, and it has adjusted exceptionally well. I repotted it into a larger white pot that I found for a killer deal. This plant does not require direct sunlight. I do not have mine near a window, but it does get some light, just not direct. So, this is perfect for spaces you might want a plant but doesn’t have a lot of direct light. It is very forgiving, so if you accidentally forget to water it, it will be just fine. Of course, this one cleans the air too. Particularly the carcinogens, benzene, formaldehyde and toluene. So, I brought one of these beauties home recently. Really, only because I accidentally drown my baby FLF. Oops. (Even green thumb people can make the mistake of over-watering every now and then) So, on to the next one. Another easy plant to care for with a lush tropical look. This plant LOVES bright light. Water once a week. I usually give mine around 8-12 ounces of water, just make sure you don’t let it dry completely out in between, after all it is a tropical plant and thrives in wet humid conditions. All the beach vibes with this one. It is known to purify the air and remove toxins such as benzene, formaldehyde, and carbon monoxide. Just starting with a plant collection? I would definitely recommend a snake plant or aloe to start out. They are both SO easy! Check out the video I recently did with Emily of Greenerie on some simple plant tips! Don’t be scared of plants, they will usually let you know if you are doing something wrong! 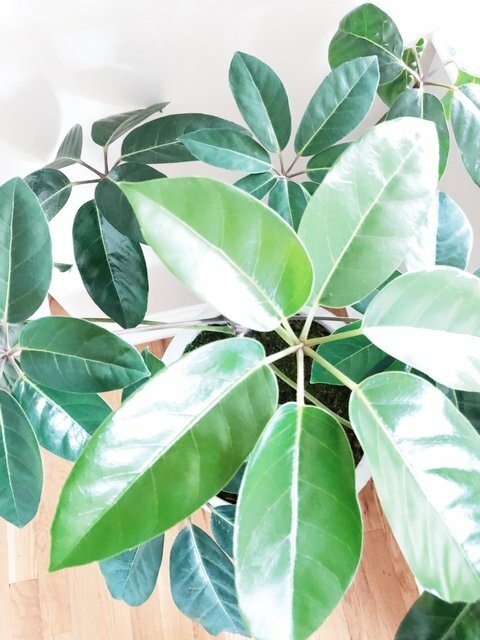 Do you already have a plant collection, if so what is your fav indoor plant? !